The Kongo kingdom encountered by the Portuguese in the early 1480s was an extensive, well-organized state encompassing a diversity of affiliated peoples. The Kingdom exchanged emissaries with the Portuguese court. The elite converted to Christianity and maintained a trading partnership with Europeans for years. The power of the kind and court was affirmed by a wealth of prestige objects and emblems, including royal funerary sculptures called ntadi, which were carved from steatite and placed on graves as memorials. Intended as conceptual likenesses, they also exude the monumental composure appropriate to a person of importance. 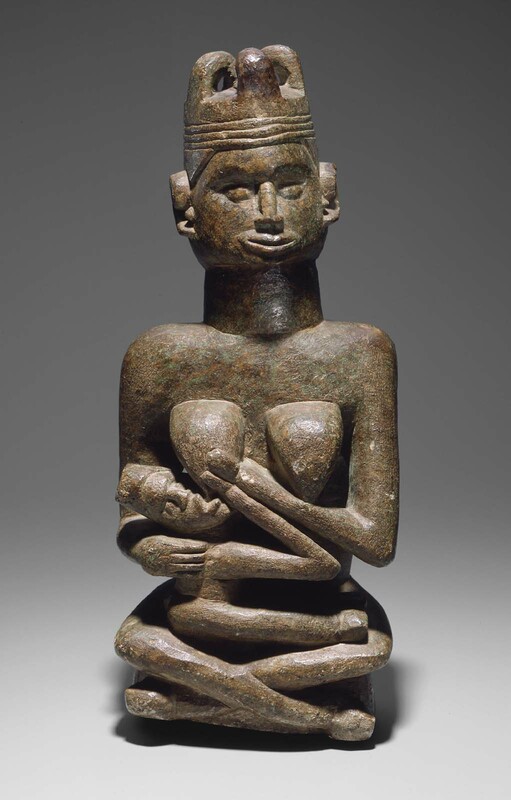 This ntadi portrays a mother nursing a child. Her headdress incorporates four leopard claws, a reference to the kind of the forest and thus a symbol of royal authority. While some ntadi represent men, many are of women, who were honored in this matrilineal society as founders and propagators of the dynasty. Some ntadi originally were painted, and flecks of green remain on this figure.